Leonid Afremov "Family Portrait" Limited Edition Giclee on Canvas, Numbered and Signed; Certificate of Authenticity. This piece is Gallery Wrapped. 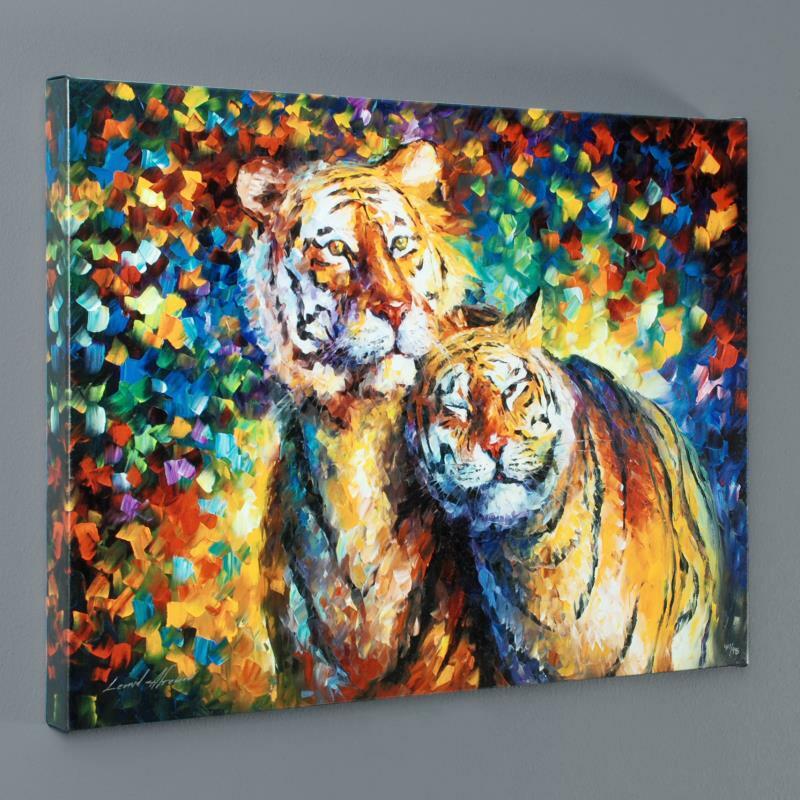 Leonid Afremov's masterful use of color and texture make his paintings unique collectibles that are sure to brighten any wall. "Family Portrait" is a limited edition giclee on canvas. The piece is numbered and bears the artist's authorized signature. This piece comes gallery wrapped. Includes Certificate of Authenticity! Measures approx. 24" x 18" (image). Leonid Afremov was born in Vitebsk, Belarus in 1955. 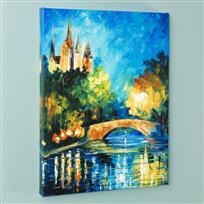 Displaying an aptitude for art at an early age, Afremov was encouraged to pursue his natural talent. 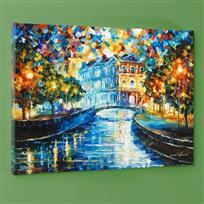 Afremov then attended the Vitebsk Education Institute where he studied in the arts and graphics department. During his years at school, he was introduced to the works of Chagall, Picasso, and Dali, all of whom would heavily influence Afremov’s work. After completing his studies, Afremov worked as a label designer for a local beer and liquor factory and as a set designer for the local theater. The Cold War climate and the Communist regime was not a nurturing environment for Afremov’s creative process, and in 1990 he moved to Israel with his family. Afremov then moved his family yet again, this time to Florida. While in the United States, Afremov was able to find a market for his work, and he was able to express himself more artistically. Like Chagall, Afremov favors the use of a palette knife rather than a paintbrush, and he has painted prolifically since leaving Israel. Currently, Afremov lives and works in Play Del Carmon, Mexico where he spends much of his time painting in quiet. Leonid Afremov "Los Angeles 1930" Limited Edition Giclee on Canvas, Numbered and Signed; Certificate of Authenticity. This piece is Gallery Wrapped. 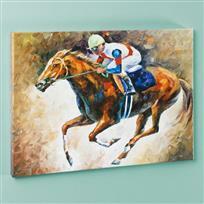 Leonid Afremov "To Walk Alone" Limited Edition Giclee on Canvas, Numbered and Signed; Certificate of Authenticity. This piece is Gallery Wrapped. Leonid Afremov "First" Limited Edition Giclee on Canvas, Numbered and Signed; Certificate of Authenticity. This piece is Gallery Wrapped. 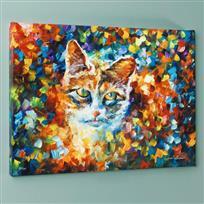 Leonid Afremov "Bright Eyes" Limited Edition Giclee on Canvas, Numbered and Signed; Certificate of Authenticity. This piece is Gallery Wrapped. 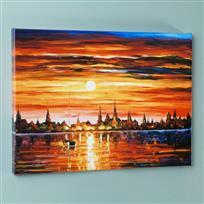 Leonid Afremov "Sunset in Barcelona" Limited Edition Giclee on Canvas, Numbered and Signed; Certificate of Authenticity. This piece is Gallery Wrapped. 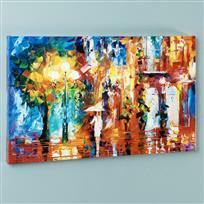 Leonid Afremov "Streetside Expression" Limited Edition Giclee on Canvas, Numbered and Signed; Certificate of Authenticity. This piece is Gallery Wrapped. 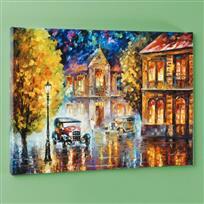 Leonid Afremov "Perfect Night" Limited Edition Giclee on Canvas, Numbered and Signed; Certificate of Authenticity. This piece is Gallery Wrapped. 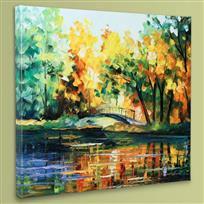 Leonid Afremov "A Thoughtful Gift" Limited Edition Giclee on Canvas, Numbered and Signed; Certificate of Authenticity. This piece is Gallery Wrapped. 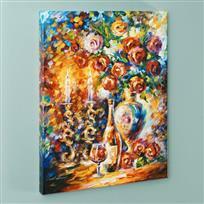 Leonid Afremov "Shabbat" Limited Edition Giclee on Canvas, Numbered and Signed; Certificate of Authenticity. This piece is Gallery Wrapped. Leonid Afremov "House on the Hill" Limited Edition Giclee on Canvas, Numbered and Signed; Certificate of Authenticity. This piece is Gallery Wrapped.